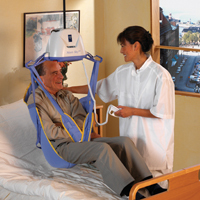 A portable ceiling lift solution that allows a single caregiver to perform transfers under handset control without stress or strain and with no manual lifting. • Weighing just 14.3 lbs (6.5 kg), the compact lift cassette with folding sling hooks and integrated carry handle is very easy to move from room to room. Portability does not mean compromising on capacity. • The Maxi Sky 440 can lift up to 440 lbs (200 kg), making it ideal for transferring most non-ambulatory residents. • The Tarzan hook feature allows the “swing” transfer of both lift cassette and resident directly from one track to another. Room to room track transfers can be performed without modifying doorways. Controls are easily accessible on the handset or the front of the lift cassette. Features such a brake, manual lowering system and stopping device safeguard the resident in the event of an emergency.